The exhibition introduces every newcomer to the phenomenon Gabrovo Humour focusing on some broadly popular Gabrovo anecdotes that have been illustrated by the inimitable Bulgarian artist Boris Dimovski. It is these anecdotes that most adequately reveal the inner mind and mentality of the mountain-dweller faced by the challenges of a life of hardships and deprivations.This hard life enforced a more economical and economically determined attitude to everyday matters. Gabrovians did not perceive thriftiness as an entirely negative quality, and it explains why they were also among the most generous donors when it came to serving public causes and deeds. However, the conceivable dimensions of thriftiness did unleash local jokers' imagination. The multimedia presentations How Gabrovo Became a Humour Capital? and The Wonders of Gabrovo Thrift follow the chronology of events that brought about the wide recognition of Gabrovo as the Bulgarian humour capital and offer a short tour of some town sights - public buildings, bridges and monuments - which epitomize the economy, the ingenuity and the acumen of Gabrovo citizens. The focal point of this eclectic exhibition is eight beautiful tapestries designed by Bulgarian artist Boris Dimovski (illustrator of Gabrovo Anecdotes booklet) on the subject matter "What if Adam and Eve were full-blooded Gabrovians?" Pieces of small Bulgarian sculpture and matching "Garden of Eden" jokes enhance the feeling that man-woman relations remain the topic of the day. Addressed to the public at large, the exhibition opened doors entirely redesigned and displayed in a recently refurbished exhibition space to celebrate the opening of the new carnival season on 11 November, 2006. Long Live the Carnival! is the outcome of the collection and research efforts of the House of Humour and Satire in the field of masquerade festiveness; it is also a token of recognition to the donors who have kindly provided material on the subject matter. Thanks to the House's contacts with carnival cities from the world over, visitors to the museum can familiarize themselves with representative carnivals in Austria, Belgium, Bulgaria, Germany, Mexico, France, Switzerland, Japan, etc. On show are authentic carnival costumes, masks, accessories and publicity material. 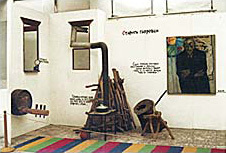 The succinct commentary in Bulgarian and English makes it possible for visitors to go round the exhibition without a guide. By illustrating carnival moments of Gabrovo, Shoumen, Yambol, Pernik, Rakovski and Rouse, Bulgarian masquerade tradition is assigned a particular place in the display. Presented in details is the Gabrovo masquerade from the beginning of the 20th century until the present day. Because of its carnival, Gabrovo has joined the big family of the Foundation of the European and Mediterranean Carnival Cities. Long Live the Carnival is the perfect backgound for opening the carnival season in Bulgaria on 11 November, at 11 h 11' every year. A number of photographs underscore the part the House of Humour and Satire plays in drawing children and young people to the local carnival traditions (to serve the purpose, educational programmes run throughout the year). 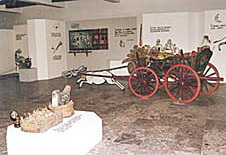 The exhibition room is equipped with a video screen that allows the showing of documentaries and educational films about the carnivals in the world. The exhibition is open to adding new exhibits, and the most valuable new donations find their place in it immediately. The House of Humour and Satire owns a unique collection of African masks, ritual items and accessories. It has been enlarged in the course of decades by means of purchases and donations made by collectors and connoisseurs of African art. The exhibition features the merry rites and celebrations of the African peoples distinguished for their originality. The variety of symbols, hot-tempered folklore and potent tradition lend them a particular sumptuousness and inimitability reminiscent of primordial celebrations where no borderline existed between the serious and the comic. On show are masks for protection and initiation, as well as 'peaceful' dance masks, sculpted figures and ethnographic objects. 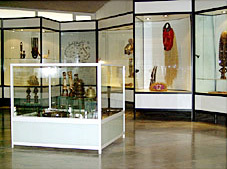 Visitors can see masks from Zambia, Burkina Faso (the BOBO), Congo (the BASONGE and the BAPENDE), Tanzania (the MAKONDE), Nigeria (the JORUBA), figures from Nigeria and Ghana (the ASHANTI), musical instruments from Nigeria and Zambia, etc. Ancient pieces of African wisdom play an important part in the exhibition, and make a fitting illustration of the different ritual objects. 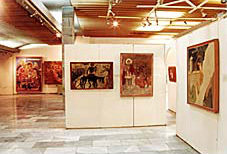 The exhibition shows a selected collection of 48 copies of frescos and fresco fragments that can be found in 20 different churches and monasteries all over Bulgaria. The murals cover the following thematic groups: The Expulsion from the Garden of Eden, The Ordeals of the Soul and Final Judgement. The subject matter gave enough freedom to a number of high-minded Bulgarian National Revival painters to ridicule and castigate everyday human vices and faults. The original frescos date back to the beginning of the 18th century.